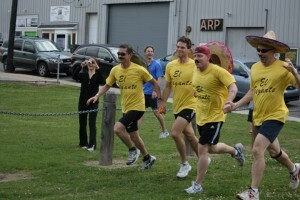 The DOUGHMAN is the world’s premier Team Relay Quadrathlon – combining competitive eating with a traditional triathlon. 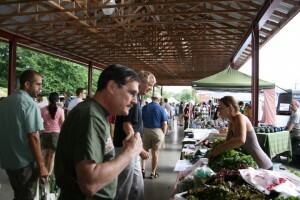 Once again the DOUGHMAN will be raising funds and awareness for the Durham Inner-city Gardeners program at SEEDS. 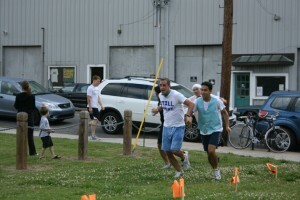 Teamwork, local foods, and athletic competition all wrapped up in a perfect philanthropic package! I’d been very intrigued by this event since hearing that part of the challenge is for each team member to gorge themselves on food catered by some of the jewels of the Durham food scene, including Daisy Cakes, Dain’s Place, Foursquare, blu Seafood, and Nosh. I’m ashamed to say I’ve only eaten food from two of those establishments so far, so really, I should have raced to further my own gastronomic experience. 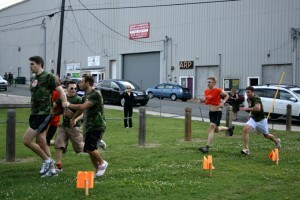 The first two teams were neck and neck and I think the edge was given to the orange team only because they remembered to hold hands faster than the camouflaged group. As you can tell, this event is fun to watch merely for the team costumes and looks of agony alone. If that team doesn’t already have sponsorship from Bandidos, the restaurant where they likely earned their shirts by defeating El Gigante burritos, then they should really look into that next year. Alas, I did not see the Man vs. Food team make it to the finish line, as I couldn’t stop myself from wandering over to the Durham Farmers’ Market, which is also held at the park every Saturday morning and Wednesday afternoon. There was also a row of craft booths across the street and plenty of yummy looking vendor carts in addition to produce and flowers. I will be back-if I can ever get myself out of bed that early again. Next year, I might just have to volunteer for The Doughman or at least pick a spot where I can watch the racers gorge themselves on delicious cheeseburgers, BLTs and cupcakes first thing in the morning. For more pictures of the finish line, check my photo website here.